Buying golf clubs can be overwhelming if you don’t know where to begin. Well, look no further than GlobalGolf.com when shopping for all of your golf club needs. Our outstanding and knowledgeable customer service staff is on hand to answer any questions you may have and help you get the right club for your needs. We also have a comprehensive golf club buying guide if you'd like to learn about the various clubs and parts of a club. GlobalGolf.com is proud to offer drivers, fairway woods, hybrids, iron sets, wedges, and putters from the top club manufacturers in the game. 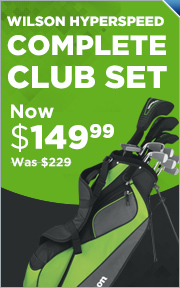 We also offer individual golf irons and golf club sets from select manufacturers. Choose from clubs made by Adams, Callaway, Cleveland, Cobra, Mizuno, Nike, Ping, TaylorMade, Titleist, Wilson and many more. And no matter what specs you need in your club, we have you covered. We offer right and left-handed golf clubs in both new and pre-owned conditions for men, ladies, or juniors. And if you want to build your own set, we can even help you do that on our custom golf clubs page. Our inventory of new and used golf clubs changes on a daily basis, so check back often for our most current selection of clubs.